Shout! 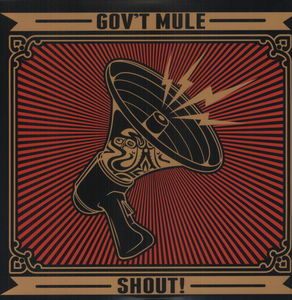 – Gov’t Mule’s first studio album in four years features 11 tracks recorded by the band in Los Angeles and Stamford, CT plus a bonus album download featuring an all-star lineup of vocalists interpreting The Mule’s new songs. Special guests Elvis Costello, Ben Harper, Dr. John, Toots Hibbert, Glenn Hughes, Jim James, Myles Kennedy, Dave Matthews, Grace Potter, Vintage Trouble’s Ty Taylor and Steve Winwood appear on the bonus download of Shout! The 2 record album – which marks Gov’t Mule’s Blue Note Records debut is pressed on 180 gram red and gold vinyl in a gatefold album with a double MP3 download. All vinyl Pre-orders will come with two additional downloads including one of live Mule and the second featuring the guest vocal tracks.